Third favorite K T Brave displayed a remarkable stretch run against a stellar field of graded winners to claim this year’s JBC Classic. After registering an eighth in his debut start over turf as a two-year-old, the son of Admire Max was switched to dirt racing and has successfully collected 11 wins which are all over distances of 1,800 meters or more; the Hyogo Championship, the Hakusan Daishoten and the Urawa Kinen in 2016; the Nagoya Daishoten, the Teio Sho in 2017; the Kawasaki Kinen, the Diolite Kinen and his most recent win, the Nippon TV Hai this year. This is the first JBC Classic victory for both trainer Haruki Shigeyama and jockey Yuichi Fukunaga while Fukunaga has won the JBC Sprint with Sterling Rose in 2002. K T Brave traveled two-wide in mid-field, made an early move after the third corner, moved up in position and entered the straight in third. With a clear path ahead of him, the chestnut unleashed an impressive run to the line swooping past the stubborn Sunrise Soar 100 meters out while holding off the fast closing Omega Perfume by 3/4 length for the title. “The horse was in top condition which made me very confident today. He struggled a bit to keep up with the fast pace, but he has won at the highest level under the same kind of circumstances so I wasn’t worried about that. There’s no doubt he has many wins ahead of him and I’m happy we did well today”, jockey Yuichi Fukunaga commented after the race. Three-year-old and second favorite Omega Perfume raced wide after breaking from stall 14 and was unhurried in lower mid-field, a length behind K T Brave. Kicking into gear after the third corner, Omega Perfume chased the eventual winner into the straight and with a tremendous burst of speed stormed down the stretch, tagging Sunrise Soar close to the wire, but was 3/4 length short from the winner for second. Race favorite Sunrise Soar broke well and was driven to the front, briefly surrendered the lead between the third and last turn but quickened to hit the straight first, stretched well but succumbed to the fast closing speed of K T Brave 100 meters out and then Omega Perfume in the final strides for third. 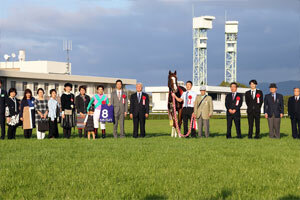 A. Murayama Shadai Race Horse Co., Ltd. The JBC Classic, which is the main event of the JBC festival, is an important race that leads up to JRA’s Champions Cup (G1, dirt, 1,800m) a month later. 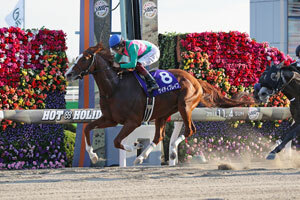 Past JBC Classic victors include several JRA Award Best Dirt Horse winners such as Admire Don (’03&’04); Vermilion (’07); Hokko Tarumae (’14); Copano Rickey (’15); and Sound True (’16). This year’s line-up included the top four finishers of the trial Nippon TV Hai (dirt, 1,800m; Oct.3); winner K T Brave who also won this year’s Kawasaki Kinen (dirt, 2,100m), 2016 Tokyo Daishoten (G1, dirt, 2,000m) victor Apollo Kentucky in second, 2016 Best Dirt Horse Sound True in third and 2017 Champions Cup runner-up T M Jinsoku was fourth. 2018 February Stakes (G1, dirt, 1,600m) champion Nonkono Yume and 2017 Kawasaki Kinen victor All Blush came off a fourth and fifth, respectively, in the Mile Championship Nambu Hai (dirt, 1,600m; Oct.8). The Korea Cup (dirt, 1,800m; Sep.10) runner-up Chrysolite also ran along with Centurion, Sunrise Soar and Omega Perfume, winners of the March Stakes (G3, dirt, 1,800m), the Heian Stakes (G3, dirt, 1,900m) and the Sirius Stakes (G3, dirt, 2,000m), respectively.